The Green House is Liz Earle Beauty Co. Ltd’s head office, located in Ryde on the Isle of Wight. The building was originally designed and constructed to minimise its environmental impact, with ground source heating, rainwater harvesting and solar energy generation in place. When phase two was completed at the beginning of 2012, it virtually doubled the size of The Green House, adding more offices and a new reception area, plus a bistro serving cooked meals to employees and visitors, which dramatically increased the amount of food waste they were creating. As Liz Earle wanted to continue with the company ethos of ‘treading lightly’, composting seemed an obvious solution for them, with a longer-term plan of producing compost for their various garden and woodland projects. 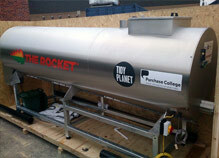 Their rocket composter (an A700) arrived in the summer of 2012, and coincided with a change to a dry mixed recycling arrangement with their waste disposal company. Overnight they went from multiple bins for segregation to two; dry mixed waste and food waste, removing food from the dry stream and significantly reducing disposal costs. When food is removed from the dry waste stream there is less contamination, and more dry waste can be recycled. After the initial set-up period was completed, creating the optimum conditions for the natural compost bacteria and fungi to thrive, they were off! The composting process has been running continuously and successfully ever since. Liz Earle have a dedicated green team who help to feed and maintain the rocket, and the team have all become experts in recognising the composting process, and how to manage it. They’ve learned when to adjust the temperature, add more or less wood chip, and alter the moisture content quickly and efficiently, for the perfect results. 100% of the food waste generated in The Green House goes through the rocket, producing around 700 litres of compost a week. Once it has spent 14 days going through the machine, the compost matures in bays in their woodland for three months before use. What happens to the compost they produce? Rocket compost makes an excellent soil conditioner. They suffer from a very sticky clay soil at The Green House, so introducing large amounts of compost into it adds structure and aids drainage. In their woodland, they’ve been using it as a mulch for the newly planted hawthorn, blackthorn and sea buckthorn hedging. This year they built the new botanical garden at The Green House. Their raised beds are filled with their own compost, and they are growing botanicals and food crops for use in their bistro. Pictured here are the first of their heirloom tomatoes. Tomato plants normally require a lot of feeding during their development, but in fact, none of their plants have needed any additional feed, which is unusual, but illustrates just how nutritious the compost is! Any waste produced from growing or using the fruit and vegetables is put back into the rocket – meaning that none of it ever leaves the premises, and with an estimated 20 tonnes of food waste processed each year, their rocket has certainly played its part in minimising landfill.